There are those random areas in our homes that seem to be begging for décor, but they tend to be a little, well, awkward. The wall next to the front door. That open spot under the stairs. And the space above the kitchen cabinets, where it seems as if something should go there…but what? If the styling in your kitchen seems to be lacking in some way and needs just the thing to create a finished look, filling that area above the cabinets might be the answer. There are actually myriad possibilities for decorating that space, proven through featured designers, bloggers, and Instagrammers. From vintage art to practical storage, you can put that space above the cabinets to work. You may enjoy collecting certain objects, but you may not have a specified place for them and end up keeping the pieces hidden away in the basement or a closet. If you haven’t been able to find the right place to showcase that collection, look to the space above your cabinets. The eye will naturally be drawn upward toward your finds, which have their own particular place to stand out. Vases, vintage letters, and even books are ideal to display above cabinets. A series of pitchers filled with faux flowers is also an ideal way to fill the void. You want to make sure, though, that the objects are large enough to see once up high; a collection of salt and pepper shakers, for example, may not be the right scale for that spot. The space above your cabinets can be built up to serve a specific purpose, like providing extra storage. Cleverly use the area above your cabinets to hold baskets, making for additional storage space in your kitchen. The baskets can keep small items and extra kitchen supplies out of sight while adding a decorative touch to the room. Using a set of matching baskets creates a uniform look, and adding vertical dividers will give the space an even more organized and clean appearance. If you have enough room, you can hang items on the wall in the space above your cabinets. Whether it’s framed family photos, mirrors, small macramé creations, or vintage baking or cooking tools, this extra wall space surprisingly caters to wall art of almost any kind—but flea market treasures seem to look even more charming. You may be thinking this sounds old fashioned, reminiscent of the kitchen decor of the 1980s where climbing vines trailed along the tops of the kitchen cabinets. But nowadays you can find realistic looking faux plants that will bring a current vibe to any space. A bit of green in the kitchen is always a welcome touch, and buying a few of the same style will keep the room looking fresh and clean. Stores like IKEA sell little artificial plants that you can put in identical pots and rest above your cabinets. Add a few other similar arrangements on the counter and dining table to tie it all together. Sometimes no matter the size of the kitchen and how much storage there is, we still run out of space. 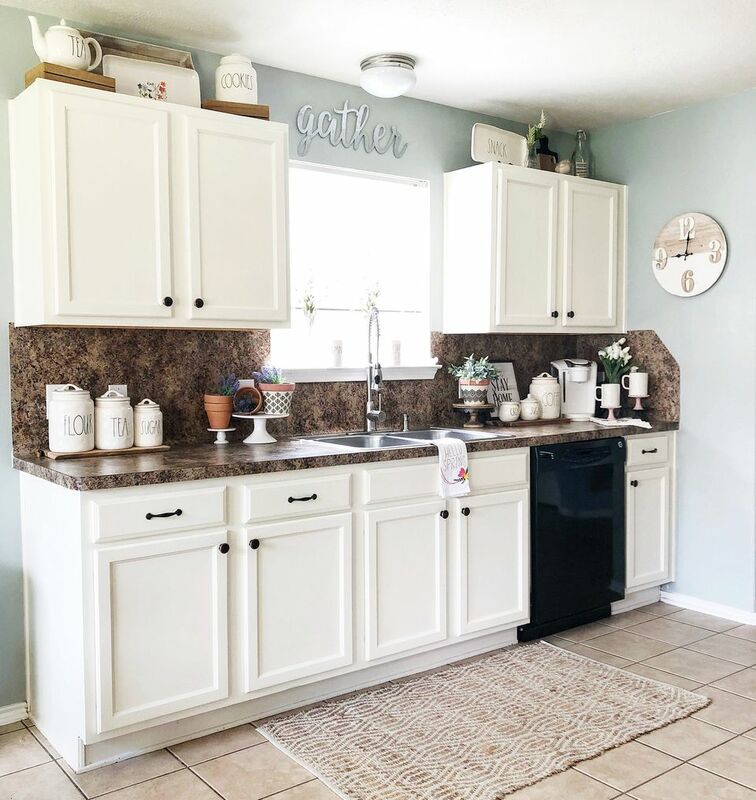 It may be that there's just not a spot for the extra rolls of paper towels, or the vintage kitchen scale won't fit in a cabinet or on the countertop. That's where the spot above the cabinets comes in handy. Display surplus kitchen necessities, cake stands, and trays, while mixing in a few decorative pieces for visual interest. Stick to one color palate for a streamlined look. If you have high ceilings, it can be tough to track down décor objects that are tall enough to fill the space above the kitchen cabinets and work seamlessly with the rest of your kitchen styling. Tall, artful vases and ceramic art can visually reach upward toward the ceiling, filling up the bareness above the cabinets and making for a modern feel. Gallery walls are always a classic, decorative element to bring into any home. While they are timeless and traditional, it’s refreshing to see a gallery that’s presented in a new and different way. Leaning a group of similar style artwork onto each other and the back wall makes for an interesting visual, and using frames that are all the same color creates uniformity. Whether a collection of vintage oil paintings or black and white photographs, this design element is somewhat easy to accomplish and joyful to look at. Perhaps you picked up an overscale sign on your last trip to the flea market or local design accessory shop but just can't find the right spot for it in your home. That empty, cold space above the kitchen cabinets is just perfect, whether to fit a long, vintage-inspired sign or custom family saying. It will look cozy above the cabinets, and even better when matched up with bouquets of darling faux flowers. If you have a green thumb and don't mind climbing up to water the plants every week, setting up the space above cabinets to grow an indoor garden is ideal—just be sure to purchase plants that don’t require a lot of sunlight. Low-light plants, nestled above the cabinetry, add a natural, vibrant accent to the kitchen. Using similar style and colored pots will keep the look clean and contemporary.